Madrid (Spain) – May 30, 2018 (travelindex.com) – UNWTO Secretary-General Zurab Pololikashvili took office in January 2018. He presented the Organization’s management vision and priorities at the 108th session of the Executive Council, held on 23-25 May 2018 in San Sebastián, Spain. The management vision emphasizes the need to make tourism smarter, more competitive and more responsible towards the goal of establishing the sector as key for the 2030 Agenda. In line with this, the management proposes five key priorities: innovation and digital transformation; investments and entrepreneurship; education and employment; safe, secure and seamless travel; and social, cultural and environmental sustainability. 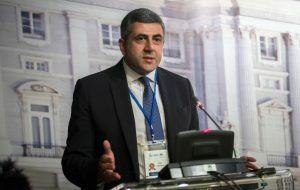 Seeking to optimize the efficiency of the Organization Secretary-General Pololikashvili introduced a new leadership structure consisting of a Deputy Secretary-General and two Executive Directors. Each one oversees key structural areas and departments of the Organization for increased efficiency in achieving UNWTO’s goals, including adding value to members, increasing membership and serving the tourism sector as a whole. The management team works towards a comprehensive vision for development of the tourism sector. This includes positioning tourism as a policy priority, establishing thought leadership in knowledge and policy creation, increasing resources and strengthening UNWTO’s capacity through meaningful partnerships. The Executive Council endorsed the renewed logo of UNWTO, presented by the Secretary-General. The logo is a visual reflection of the management vision and priorities, signalling clear objectives, unity and transparency, as key ingredients to fulfill the mission and vision of UNWTO. UNWTO is placing focus on its innovation and digital transformation strategy, aimed at positioning the Organization as the leading global agency in the digitalization of tourism. Against this backdrop UNWTO staged a thematic discussion on tourism and the digital transformation with a dynamic exchange of ideas between high-level representatives of Google, Destinia, Amadeus IT Group, Mastercard, Room Mate and FC Barcelona. Moderated by Argentina’s Minister of Tourism Gustavo Santos, an open discussion followed with governments, start-ups, investors, academia and institutions attending.